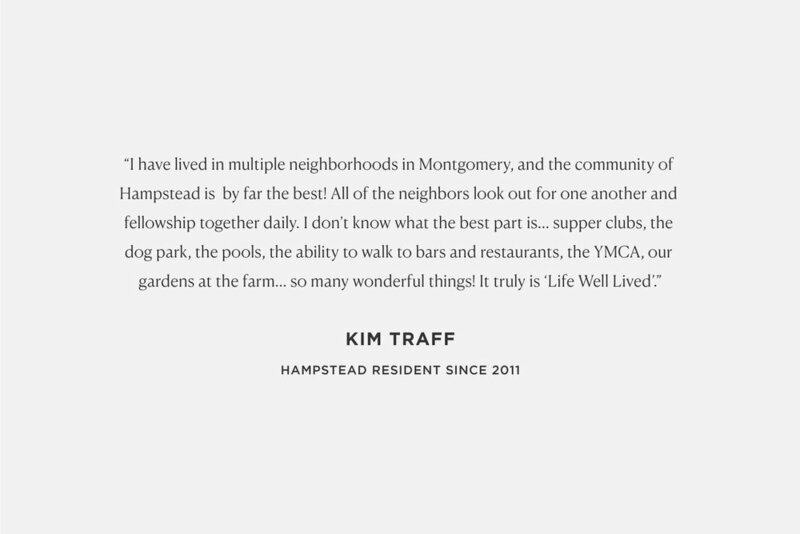 From the planners of Seaside, Rosemary Beach, and Alys Beach, Hampstead is a walkable, vibrant, mixed-use community combining homes, restaurants, shops, work places, schools, a YMCA, and Montgomery's best amenities. 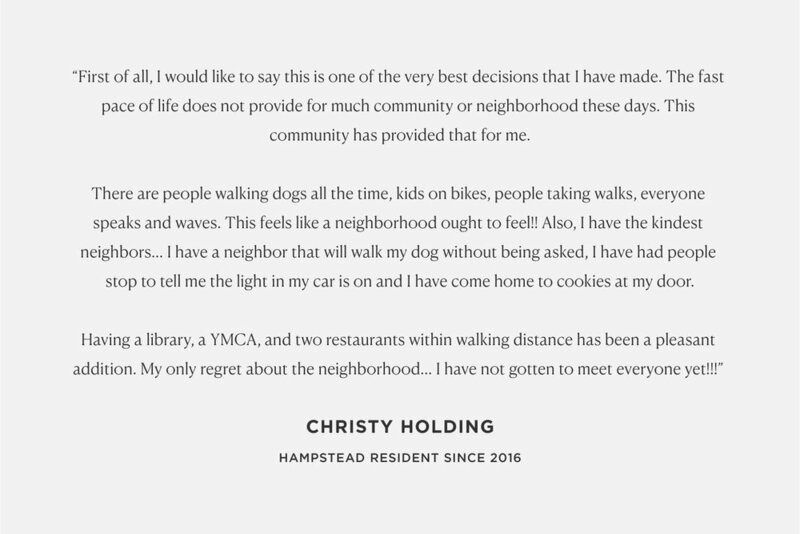 Our neighborhood is walkable, efficient, and connected. Our homes vary from town homes and condominiums to spacious courtyard plans and large estate homes. Our residents enjoy an unrivaled quality of life in a setting that is unique and fun. With the best selection of new homes for sale in Montgomery, AL come visit and find out why Hampstead is growing faster than any other Montgomery community! Take your time browsing our website and get to know us. Once you have, come visit. You won't be disappointed. Hampstead is created based on Traditional Neighborhood Design, combining all that is innovative and exciting, right at your doorstep. Led by acclaimed international planners Duany Plater-Zyberk & Company, creators of Seaside, Alys Beach, and Rosemary Beach in Florida, Hampstead is crafted by dedicated architects, designers, and its founders since 2008. Hampstead has received national awards including the Congress for New Urbanism's Charter Award and media attention for these innovative efforts. We strive to connect people to create a vibrant, true community • design and create innovative methods to develop and preserve the land • create sustainable homes within a sustainable community using technology and New Urbanist theory • promote the importance of design, arts, craft, agriculture and education within the cultural heritage of the New South • value the quality of life created in a cohesive community that offers places to live, work, learn, rest, grow and have fun. New Urbanism is a national movement to create walkable, connected, mixed-use communities. The Traditional Neighborhood Design (TND) advocated by New Urbanists is a revived movement that combines homes of all types and sizes with daily needs, education, restaurants, work, and healthful living in one cohesive, diverse neighborhood. Think of the way your grandparents lived, or the way Brooklyn or Boston works, and you've got it. It's a healthier and friendlier way of life, where people truly get to know each other, you spend less time caught in traffic, more time enjoying life. 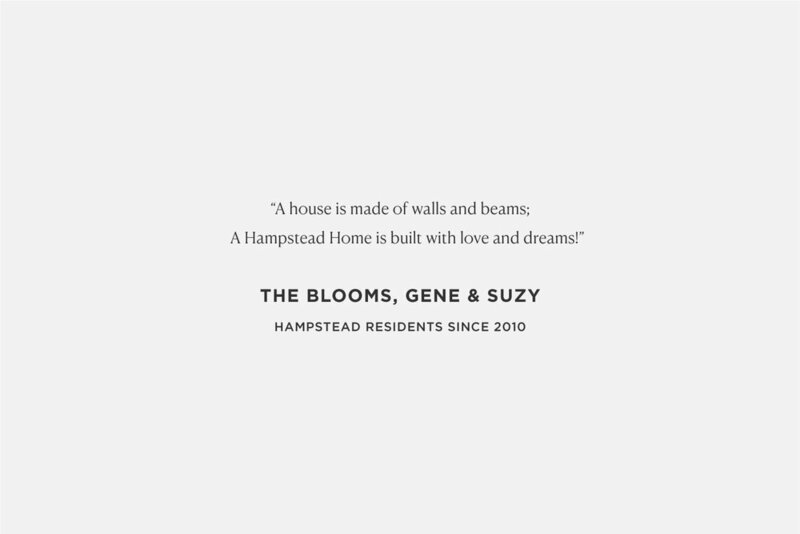 Hampstead is at the forefront of sustainable community building nationwide and benefits from the experience and guidance of our renowned planners. We are the first new community in the U.S. to be designed and built under the SmartCode, an innovative zoning code that encourages diverse, mixed-use neighborhoods. 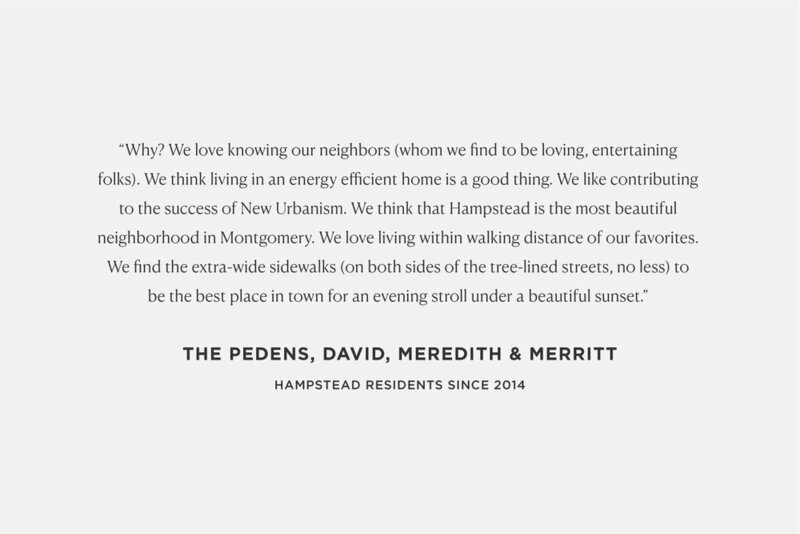 We Can’t Tell You How Great Hampstead Is - But Our Residents Can!